Ailyn Perez, soprano; Stephen Costello, tenor; Patrick Summers, BBC Symphony Orchestra. Warner Classics 0825646334858. 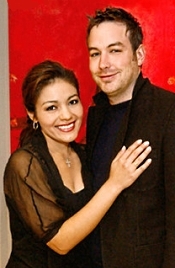 First, a word about the principals: The Associated Press called soprano Ailyn Pérez and tenor Stephen Costello “America’s fastest-rising husband-and-wife opera stars,” and the New York Times praised them for their “palpable chemistry.” They were both honored as winners of the prestigious Richard Tucker Award (Costello in 2009 and Pérez in 2012), and on the present debut album for Warner Classics they perform a selection of love duets from opera and musical theater. The program includes eleven selections: “Toi! Vous!...N’est-ce plus ma main” from Massenet’s Manon; “Suzel, buon di!” from Mascagni’s L’amico Fritz; “Signor ne principe--E il sol dell’anima...Addio! speranze” from Verdi’s Rigoletto; “Caro elisier!...esulti pur la Barbara” from Donizetti’s L’elisir d’amore; “Il se fait tard!” from Gounod’s Faust; “Un di felice” from Verdi’s La traviata; “O soave fanciulla” from Puccini’s La boheme; “One hand, one heart” from Bernstein’s West Side Story; “If I loved you” from Rodgers & Hammerstein’s Carousel; “I’ll know” from Frank Loesser’s Guys and Dolls; concluding with “And this is my beloved” from Wright and Forrest’s Kismet. Maestro Patrick Summers and the BBC Symphony Orchestra ably support the duo. Anyway, what could be more appropriate for two young stars in love, especially for their first album, than a collection of love duets? Of course, they’re both in fine voice; there’s not much question about that unless you’re a fervent opera fan and have an obsession for particular kinds of operatic voices. For most of us, they sound just fine, if perhaps not yet in the superstar class where a tenor and soprano can go virtually anywhere with their talents. Let’s say that with Perez and Costello, it’s close enough. As usual with these things, the opening number sets the tone. Both singers display a tremendous vocal range as well as a wide emotional sweep. 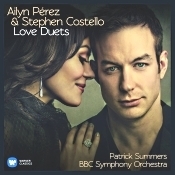 Obviously, these love duets require a fair amount of dramatic skill as well as vocal talent, and here Perez and Costello shine. Of course, like any subjective talents, their voice and dramatic skills remain open to interpretation. One listener might find them impressive, another satisfactory, and still another annoying. I didn't find any distracting mannerisms in their singing or acting skills, but I'm no expert in things operatic. There is certainly nothing halfhearted about their presentations. They belt out the songs in splendid form, perhaps too intensely at times; but surely you can't fault their enthusiasm. The two opening numbers, for instance, by Massenet and Mascagni, seem almost extravagantly expressive. While the singers convey the big, dramatic moments effectively, they don't always provide a commensurate degree of lyricism in the softer passages. But, again, this is just how the songs struck me personally; other listeners will surely find the presentations both moving and exciting. And so it goes through the classical operatic numbers. I particularly enjoyed the playfulness in their rendering of the first Verdi selection and the passion of the second Verdi item and the Puccini. It was with the final tracks, the four Broadway selections, that I had any initial hesitation. I worried at first that Perez and Costello’s operatically trained voices might be too heavy for the lighter stage roles. They swept aside my concerns, however, offering up perfectly enjoyable versions of all four songs. Their voices are perhaps bigger than we might find on the popular stage and, thus, take a moment's getting used to, but once attuned to them, they easily win us over. OK, maybe the Guys and Dolls number requires a stretch to imagine, chiefly Costello as a colorful Damon Runyon character; but, hey, if Brando could almost pull it off in the movie version of the play, I guess you can get used to anybody. The closing Kismet selection is possibly the best of the Broadway items because it comes closest to grand opera, anyway. Producer Stephen Johns and engineer Philip Burwell recorded the music in December 2013 at Studio 1, BBC Maida Vale, London. The sound is slightly aggressive; that is, the frequency balance favors the upper midrange, making some high notes a little shrill and glassy, occasionally even fierce. The voices are out front, as we might expect, the orchestral accompaniment a bit recessed and a tad soft. It sounds, in fact, a bit more like pop-music sound than it does classical, the latter usually a tad more natural. Still, given the nature of the album, that's probably not a bad thing; the sound will complement a lot of home playback systems and car radios and no doubt appeal to folks used to listening to popular music on TV and iPods. I don't mean to be too critical here, but for the ultimate in sonic realism, you might want to look elsewhere. This is just good, clean, in-your-face sound. Clifford Curzon, piano; George Szell, London Symphony Orchestra. HDTT HDCD337. Here is another absolute, genuine, certifiable, dyed-in-the-wool classic from HDTT (High Definition Tape Transfers). English pianist Sir Clifford Curzon made the recording with George Szell and the London Symphony Orchestra over half a century ago, and no one has yet to surpass it. 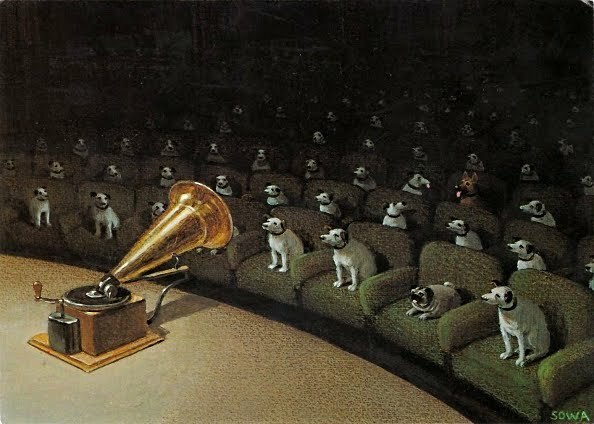 Now remastered to near-audiophile standards, it’s hard to see how any new contender will equal it. 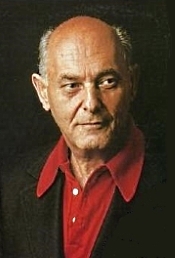 Curzon (1907-1982) made a ton of recordings in his lifetime, yet he left us with only a relative few. That’s largely because he was a notoriously fussy perfectionist when it came to what he wanted the public to hear and refused to allow record companies (mainly Decca, with whom he recorded almost exclusively) to release any number of his recordings he didn’t think were up to his standards. He just didn’t feel satisfied with them. Fortunately, the Brahms was among the few things to get through and remain in the catalogue. As I’m sure you’re aware, Brahms wrote his Piano Concerto No. 1 in 1858 while he was still a fairly young man. 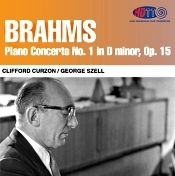 I continue to see the work as all craggy and monumental in scope, and Curzon’s potent interpretation (one of the first I remember hearing) is a chief reason for how I think of the Brahms today. The work also abounds in energy and vitality, perhaps the energy of youth, and here I think of Curzon as well, even if he was in his mid fifties when he recorded it. Anyway, after a lengthy and properly regal orchestral introduction from Szell and the LSO to set the tone, Curzon enters with elegant power. While the First Piano Concerto may be a youthful work, Curzon does not overemphasize the fact with any excessive playfulness. Indeed, his is a mature, patrician account, frank and straightforward, and all the better for it. Yet it is also a kind of cozy account, especially in terms of the interplay between soloist and orchestra. Everyone sounds comfortably together, from the grandest gestures to the most intimate moments. Curzon glides through the first-movement Maestoso with the appropriate measure of majesty, yet with a delicate lyricism as well, and Szell seems perfectly attuned to the pianist's every mood and need. In the second-movement Adagio Curzon again finds his range, although his pace is a tad more leisurely than other pianists of my experience. However, his step is never loose or slack, merely relaxed. The playing is quite lovely, the movement said to be an elegiac tribute to Brahms’s late mentor, Robert Schumann. Then, Curzon and company go out on a agreeably jubilant note in the finale, a spirited peasant dance with variations that sparkles with good cheer. The crack Decca production team of producer John Culshaw and engineer Kenneth Wilkinson recorded the concerto at Kingsway Hall, London, in May 1962. HDTT transferred it from a 4-track in 2014. The orchestral support sounds big and bold, with plenty of dynamic range, impact, warmth, and clarity. In their own remastering Decca had already minimized much of the hard glassiness of their previous CD, and here HDTT does them one better. The HDTT sound is quite smooth for the most part, with a good degree of naturalness. Still, the recording itself is somewhat flat and one-dimensional, but that's apparently the way Decca recorded it. The piano sounds realistically well balanced with the orchestra, out front but not over prominently so. It sounds about the way a piano would appear if you were sitting at a moderate distance at a live concert. In short, the HDTT remastering and transfer are excellent and make a good thing better. For further information on HDTT discs and downloads, you can check out their Web site at http://www.highdeftapetransfers.com/storefront.php. Piano Sonatas Nos. 8, 14, 19, 20, and 21. James Brawn, piano. MSR Classics MS 1466. 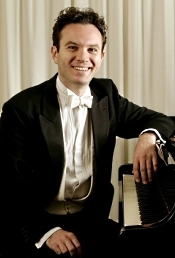 British pianist James Brawn (b. 1971) has only recently begun a recording career with MSR Classics, and at the time I reviewed his album James Brawn in Recital a month or so before coming to this one, I'm afraid I did not recognize his name. However, judging by the critical praise he received for his prior albums and my reaction to his recital album, he appears to be off to an auspicious start. He's been winning awards since he was a child, teaching, and performing (mainly in New Zealand, Australia, and England) to great acclaim, and this second of his Beethoven recordings makes one understand his appeal. As I said of him after hearing the recital disc, he is a consummate artist. 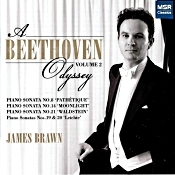 Mr. Brawn made the album reviewed here, A Beethoven Odyssey, Volume 2, in 2012 as a part of a series of Beethoven sonata discs I hope he will continue recording. The reviewed album contains three of Beethoven's most-popular sonatas, including three of the popular named pieces: the "Pathetique," the "Moonlight," and the "Waldstein," along with two shorter sonatas, Nos. 19 and 20. It makes a good introduction to Brawn's nuanced style of playing, and it should entertain anyone interested in Beethoven, no matter how many other recordings of these well-worn classics one already has. The program begins with the Piano Sonata No. 8 in C minor, Op. 13 "Pathetique," written in 1798, a relatively early work composed when Beethoven was only twenty-seven. The composer's publisher actually nicknamed the sonata "Grande sonate pathétique" (an appellation that apparently Beethoven liked) because the sonata impressed the publisher with its mellow, tragic qualities. Brawn opens the sonata as Beethoven directs, gravely, but with a sweet, nuanced care. He then moves into the Allegro section with all the "brio" or vivacity required, so he's got both the lyrical and bravura qualities down pat. His intensity is evident in every note, taking care to modulate his tone as the score demands. Still, Brawn is doing more than just following the notes and score here; he is imposing a personality on the music. He is creating, in fact, an interpretation, one that in this case he has carefully planned around the composer's wishes, so while it is clearly Brawn's reading, it remains Beethoven's music. The second-movement Andante cantabile contains the sonata's most-famous melody, and again Brawn nails it perfectly, combining nobility, melancholy, longing, passion, and drama in balanced order. Then Brawn closes the piece with a playful Rondo, in which he matches the intensity of the opening movement with a demonstration of pianistic virtuosity that is quite dazzling. The result is a brilliant rendering of an old warhorse. Next up Mr. Brawn gives us what is probably Beethoven's most-famous and best-loved sonata, No. 14 in C-sharp minor, Op. 27, No. 2 "Moonlight," completed in 1801. The first edition of the score bears the heading "Sonata quasi una fantasia," or "sonata almost in the manner of a fantasy." The "Moonlight" business derives from the comments of a critic of the day who compared the mood of the first movement to that of "moonlight shining upon Lake Lucerne." The name stuck. The "Moonlight" begins with that lovely tune we all know so well, and Brawn's handling of it is magical. It's just as dreamy as anyone's, without resorting to an ultraslow, sentimental pace. It simply paints the picture Beethoven seems to have had in mind: a kind of mysterious, desolate loneliness, tinged with a faint silvery glow. Beautiful, done with genuine feeling for the mood and the music. The Allegretto & Trio momentarily lightens things up before the distress of the final movement. Brawn's subtle and effective transitions take us from one emotion to the next with a seamless, effortless polish, all the while maintaining the urgency and poignancy of the music. The third and fourth sonatas on the program are Nos. 19 in G minor, Op. 40, No. 1 and No. 20 in G Major, Op. 49, No. 2 "Leichte" ("Light"), brief, two-movement pieces. Although published in 1805, Beethoven probably wrote them a decade earlier. In any case, they are understandably simpler than the other sonatas, and in the few instances I've heard them performed before, the pianist always seemed to take them rather superficially. But not Brawn, who makes each item a fascinating little listening experience. The final work on the program is the Piano Sonata No. 21 in C Major, Op. 53 "Waldstein," from 1804. It got its name because Beethoven dedicated it to a close friend and patron, Count Ferdinand Ernst Gabriel von Waldstein. Or you can call it "L'Aurora" (It., "The Dawn") for the tone of the third movement, which brings to mind the image of daybreak. It is a big, grand sonata that takes the album to a big, grand conclusion. Brawn tells us in a booklet note that he sees the "Waldstein" as "a kind of rebirth" for the performer and the listener, a work "filled with physical energy and love of life." Certainly, the pianist puts this philosophy to the test from the very outset of the work as he offers a successive outpouring of notes that transform in purpose from nervous agitation to sheer pleasure. Then, in the central Introduction and concluding Rondo Brawn further impresses us with his complete command of tonal changes, flexible tempos, shifts of contrast, shadings of expression, and, of course, sheer virtuosity. I have no idea if Mr. Brawn intends to continue his "Beethoven Odyssey" through the composer's complete thirty-odd piano sonatas or wrap it up with his first three such albums. Still, I'm sure anyone who has heard his creative, highly personal, yet truthful Beethoven realizations so far can only hope for more. Mr. Brawn recorded the sonatas in April and December of 2012 at Potton Hall, Suffolk, United Kingdom. Producer Jeremy Hayes, engineer Ben Connellan, piano technician Ulrich Gerhartz, and tuner Graham Cooke attended to the details. The technicians miked the piano at a moderately close distance, all the better to pick up the instrument's detail, definition, and dynamics. Yet the acoustic environment allows enough warm, ambient bloom for the piano to sound natural and realistic. It's quite ideal, actually. Also, Piano Quintet. Sarah Chang, violin; Leif Ove Andsnes, piano. Sir Colin Davis, London Symphony Orchestra. EMI 7243 5 57521 2 3. 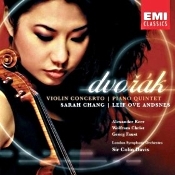 Sarah Chang's recording of Dvorak's Violin Concerto with Sir Colin Davis and the LSO has been around for more than a decade now and remains one of the best versions currently before the public. It may not be the absolute best ever (my own favorite is still Perlman's mid-Seventies release with Daniel Barenboim, also with the LSO), but it's close. Different but close. If there can be such a thing as a feminine approach to a work, that's the difference between this 2001 recording and Perlman's. The Dvorak Violin Concerto is a composition of startling contrasts, yet Chang and Perlman approach them differently. Dvorak meant the first movement to sound somewhat melancholy, almost bittersweet, yet Chang makes it more lyrical, more lilting, more ethereal, while Perlman, still mercurial, seems more granite solid. In the second, slow movement, Dvorak turns his piece into a ballad, interrupted only occasionally by turbulent outbursts, and again it's in these outbursts that Perlman appears slightly more in command. The final movement finds Dvorak returning to his roots in Czech folk music, and here it's a toss-up between Chang and Perlman as to which artist is more idiomatic and which conductor, Sir Colin Davis or Daniel Barenboim, is more supportive and sprightly. Both sets of musicians are certainly very fine, warm and powerful throughout, Ms. Chang dancing through the finale with sensitivity, exuberance, and strength. The coupling on Chang's disc is Dvorak's Piano Quintet, although to be fair the violin seems always at center stage. It's a long chamber work that's all over the map thematically from exquisitely beautiful poetry to raging storms and everything in between. The group Ms. Chang performs with--Leif Ove Andsnes, piano; Alexander Kerr, violin; Wolfgang Christ, viola; and Georg Faust, cello--sound like they have been playing together forever, their unity is so complete. The Quintet is one of Dvorak's most-popular works and deservedly so, especially when you hear this group perform it. It may not be the best recorded account available, that is primarily a matter of taste, but like the Concerto it is surely among the best. 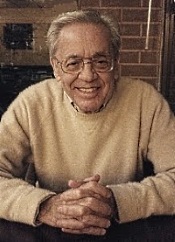 As far as concerns the sound, EMI (now Warner Classics) recorded the music in June 2001 at Watford Colosseum, London and gave both pieces on the disc a fairly decent image balance, the violin in the Concerto never too dominant as it is in EMI's earlier recording with Perlman where the soloist is well forward. However, the Chang recording emphasizes the high end more than the older Perlman disc did, making the sound of the Chang version appear thinner, lighter, and brighter. Fortunately, it's not entirely objectionable and, in fact, may even serve to more greatly emphasize the lighter, gentler approach I mentioned earlier that Ms. Chang brings to the Concerto. In all, it's a lovely enough recording. 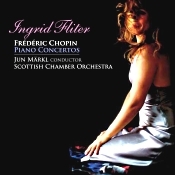 Ingrid Fliter, piano; Jun Markl, Scottish Chamber Orchestra. Linn Records CKD 455. I've loved Chopin's Piano Concerto No. 1 in E minor, Op. 11 for as long as I can remember. While it may not be the greatest music in the world, it is among my favorites. As Frederic Chopin (1810-1849) was primarily a pianist and composer for the piano, most of what he wrote was for solo piano. Maybe that's why the orchestral accompaniment he provided for his two piano concertos can sometimes seem almost like an afterthought. But that's of no consequence with melodies so lovely and memorable as his. Anyway, I hope you'll forgive my bias for liking practically every recording of Chopin's First Piano Concerto that comes along, and when we get the Second Concerto thrown in for good measure as in this disc from pianist Ingrid Fliter, it's an almost instant winner with me. Not that Ms. Fliter displaces my two absolute favorites, however: Maurizio Pollini (EMI) and Martha Argerich (EMI), or the several recordings in my collection from Arthur Rubinstein (RCA), Thomas Vasary (DG), and Yundi Li (DG). Nevertheless, Ms. Fliter is in the running. Chopin wrote his Piano Concerto No. 1 in 1830, within a year following his Piano Concerto No. 2, but he published No. 1 first. So if No. 1 seems the more mature of the two, well, by a few months it actually is. Chopin described the second movement of No. 1 as "reviving in one's soul beautiful memories." In Chopin's case, he composed the piece when he was about nineteen or so and smitten at the time with a beautiful young student, Constantia Gladkowska, at the Warsaw Conservatory. Although he barely talked to her and she soon married somebody else, he may have had her in mind when he wrote his piano concertos, as well as a few other works. Of course, the piano parts dominate both piano concertos, the better to showcase Chopin's own virtuosity on the instrument. Yet with the Piano Concerto No. 1, the piano doesn't even enter the picture until after a fairly lengthy orchestral introduction. Maybe the composer intended the prolonged preamble to make the piano's entrance all the more grand. It certainly works that way. Anyhow, while Fliter, Markl, and the Scottish Chamber Orchestra open the piece big, it doesn't sound quite as dramatic as some other conductors and orchestras do, probably because of the reduced size of the chamber ensemble. Be that as it may, the introduction is impressive enough in its way and sets an intimate tone for the main theme to follow. Then Ms. Fliter takes over and the rest is hers. Born in Buenos Aires, Argentina, Ms. Fliter now divides her time between Europe and the U.S. In the past decade or so, she has become something of a specialist in Chopin, having already released two well-received Chopin albums before this one, and winning the Silver Medal in 2000 at the International Chopin Piano Competition in Warsaw. Practice makes perfect, I suppose. Ms. Fliter takes the first movement of No. 1 at a slightly more leisurely pace than most of the pianists I mentioned earlier, bringing out all the beauty and Romanticism of the main theme. It is a sensitive, radiant, rhapsodic interpretation, one that will, I think, bear up under repeated listening, for I'm sure most people will want to return to it again and again. In the second, slow movement, Ms. Fliter is as delicately lyrical as any pianist I've heard. If we see the operas of Mozart as an inspiration for Chopin, we clearly hear the voice of those operas in Ms. Fliter's playing of the Romanze. Then, both pianist and orchestra acquit themselves eloquently in the spirited finale, although again Ms. Fliter tends to favor unhurried tempos. Still, the expressive pacing leads to much reward in terms of the music's nuances and color. It's quite a lovely realization of a score that never grows old. In the Piano Concerto No. 2 in F minor Ms. Fliter brings a comparable degree of refined energy to the proceedings as she did to No. 1. Although she doesn't have as many memorable melodies to play, she engages us, nonetheless, with the compelling sweetness and sheer virtuosity of her performance. The orchestra may not have quite as much to do in the Second Concerto as it did in the First, but the Scottish Chamber Orchestra proves a good, lively supporting member of the presentation, never overpowering the soloist nor behaving too subservient to her needs. So, it's a well-played and well-balanced rendering of the music. Producer John Fraser and engineer Philip Hobbs recorded the concertos for hybrid two-channel and multichannel SACD at Usher Hall, Edinburgh, UK in June 2013. In the stereo format to which I listened the orchestra sounds clean and well defined, yet with enough hall resonance to provide a realistic setting. There is also a good degree of orchestral depth to add to the illusion. Moderately wide dynamics and an adequate frequency range fill out of the equation. The piano is a bit forward for my taste, but it's certainly clear and well articulated, with no undue harshness or brightness. Overall, the Linn team have put together a rich, natural-sounding recording, one that falls comfortably on the ear. Also, Piano Concerto. Laura Mikkola, piano; NDR Choir, Hans Hagen, choirmaster; Paavo Jarvi, Frankfurt Radio Symphony Orchestra. ECM New Series 2341 481 0675. The German ECM label has been around since 1969 producing mainly jazz titles but also folk and contemporary classical. The folks at ECM have steadfastly denied any such characterizing, however, and prefer to think of themselves as providing music that knows no boundaries. More power to them. 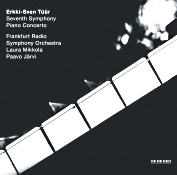 This 2014 release of music by Estonian composer Erkki-Sven Tüür (b. 1959) is a good example of their work (and, apparently, Tüür's). The music is clearly classical yet might find a wide audience appeal among jazz and even pop fans. Although Tüür studied flute and percussion at the Tallinn Music School in the Seventies and composition at the Tallinn Academy of Music, by the early Eighties he was leading the popular rock group In Spe before turning to classical composition. All of it paid off: His country awarded him the Cultural Prize of Estonia in 1991 and 1996, and he has since composed a wide variety of classical pieces including orchestral, concerto, chamber, vocal, organ, piano, and choral works; with even a film score thrown in for good measure. The program here begins with Tüür's Concerto for piano and orchestra, written in 2006. As with much modern classical music, there seems to be a conscious desire in the concerto's three unmarked movements to eschew most forms of melody or anything like a recognizable tune. I suppose that would sound too "pop" and appeal to too many people. In any case, what we have is mostly a series of sonic effects, with the piano and orchestra in constant communication, a continuous back-and-forth between the soloist and supporting ensemble. The pianist, Laura Mikkola, has a beautiful rapport with the orchestra, and their intertwining of material remains fascinating, even when the music gets a bit too rambunctious for its own good. Anyway, some of the music sounds eerie, some of it sounds brilliant, and all of it is engaging. The movements flow without intermission into one another, so as listeners we sort of drift along with it, an occasional bend in the road or shift in the tide taking us to a few surprising places. It's actually a fun journey, exceptionally well played; it's just not one I'd care to take too often. Tüür wrote his Symphony No. 7 "Pietas" for orchestra and mixed chorus in 2009. Tüür dedicated the Seventh Symphony to the Dalai Lama, according to the booklet note "a choral symphony like no other, a work where the orchestra has its own purposes, among which that of framing and supporting the voices is by no means paramount." Then there's talk of the young monk screaming when the other monks took him to the sanctuary. It is there that the symphony begins, a fascinating collection of tone impressions in four movements. The high percussion instruments play a big part in the proceedings, and they create a highly atmospheric work that is at once mysterious and glowing, with a greater emphasis on melody than we found in the Piano Concerto. Indeed, this stress on various melodies running in and out of the music might almost tempt one to think of the symphony as Romantic, if one didn't fear offending the composer with the use of such a description. In any case, the conductor, chorus (mostly hushed and heavenly), and orchestra seem attuned to the work and pull it off attractively. I enjoyed how the music floated, shifted, and hovered, yet conveyed a feeling of togetherness. The symphony's subtitle is "Pietas," a term suggesting a caring for others, a holiness, making the symphony a kind of prayer and thus returning us to the Dalai Lama theme. Very nice. In addition to the disc and jewel case, ECM provide a light cardboard slipcover. I've never been too sure of the value of a slipcover for CD's, DVD's, or Blu-ray's--they always seem an extra thing to have to remove before getting to the disc--but they do spruce up the product and make it more appealing to a prospective buyer. Producers Eckhard Glauche (Piano Concerto) and Hans Bernhard Batzing (Symphony No. 7) together with engineer Thomas Eschler recorded the music in June 2009 at Alte Oper and June 2010 at hr-Sendesaal, Frankfurt, Germany. The piano in the concerto is a little more forward than might be the case live, but it's hardly an issue and certainly sounds clean and clear. The orchestra throughout remains nicely spacious and airy, the definition and detailing solid. There are even instances of almost uncannily realistic depth and dimensionality that add to the realism. Highs are especially natural and extended; lows are adequate to the occasion; and midrange transparency appears nicely judged. 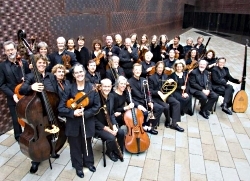 American Bach Soloists Festival & Academy: "Bach's Inspiration"
Tracing the influences of Italian, French, and North German composers on Johann Sebastian Bach's music, the 2014 American Bach Soloists Festival & Academy will feature works by Vivaldi, Pergolesi, Buxtehude, and Bach's forebears. Musical delights and discoveries will fill the days and nights of the 2014 Festival. From large-scaled masterworks for full orchestra, choir, and vocal soloists to intimate instrumental works, there will be something for everyone to enjoy. Annual performances of Bach's Mass in B Minor, large-scale instrumental and vocal works, and concert performances of Baroque oratorio and opera. Jeffrey Thomas directs performances by the American Bach Soloists, the Academy Orchestra and soloists, and the American Bach Choir. These concerts feature performances by acclaimed early music specialists. Within the framework of an intimate recital, instrumentalists and singers will present solo works with accompaniment, in programs built around programmatic themes of cultures, places, or events in history. The American Bach Soloists Academy—the educational component of the ABS Summer Bach Festival—offers advanced conservatory-level students and emerging professionals unique opportunities to study and perform Baroque music in a multi-disciplinary learning environment. Academy participants are featured exclusively in three evenings of Academy-in-Action Concerts offering chamber vocal and instrumental works by Baroque masters. American Bach Soloists Artistic & Music Director Jeffrey Thomas will be Resident Scholar at San Francisco's Grace Cathedral beginning May 13 and extending through the end of June. During this residency, Thomas will continue work on his forthcoming book on Handel's Messiah. Grace Cathedral and Handel's Messiah are a familiar combination for Thomas, who has led the American Bach Soloists (ABS) in performances of the 1741 masterwork every December for the last 15 years. These annual performances have become a cherished Northern California tradition and play to sold-out audiences year after year. The 2014 performances will be recorded by Emmy Award winning Zamacona Productions, who will utilize seven High-Definition cameras to capture the event for release on local and national television stations, as well as DVD and BluRay. Jeffrey Thomas is Artistic and Music Director of the American Bach Soloists, with whom he has directed and conducted recordings of more than 25 cantatas, the Mass in B Minor, St. Matthew Passion, Brandenburg Concertos, and works by Schütz, Pergolesi, Vivaldi, Haydn, and Beethoven. He has appeared with the Baltimore, Berkeley, Boston, Detroit, Houston, National, Rochester, Minnesota, and San Francisco symphony orchestras; with the Vienna Symphony and the New Japan Philharmonic; with virtually every American baroque orchestra; and in Austria, England, Germany, Italy, Japan, and Mexico. He has performed at the Santa Fe Chamber Music Festival, Spoleto USA Festival, Ravinia Festival, Saratoga Performing Arts Center, Berkeley Festival and Exhibition, Boston Early Music Festival, Bethlehem Bach Festival, Göttingen Festival, Tage Alte Musik Festival in Regensburg, E. Nakamichi Baroque Festival in Los Angeles, the Smithsonian Institution, and at the Brooklyn Academy of Music's "Next Wave Festival," and he has collaborated on several occasions as conductor with the Mark Morris Dance Group. Before devoting all of his time to conducting, he was one of the first recipients of the San Francisco Opera Company's prestigious Adler Fellowships. Cited by The Wall Street Journal as "a superstar among oratorio tenors," Mr. Thomas' extensive discography of vocal music includes dozens of recordings of major works for Decca, EMI, Erato, Koch International Classics, Denon, Harmonia Mundi, Smithsonian, Newport Classics, and Arabesque. 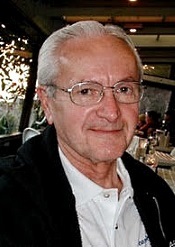 Mr. Thomas is an avid exponent of contemporary music, and has conducted the premieres of new operas, including David Conte's Gift of the Magi and Firebird Motel, and premiered song cycles of several composers, including two cycles written especially for him. He has performed lieder recitals at the Smithsonian, song recitals at various universities, and appeared with his own vocal chamber music ensemble, L'Aria Viva. 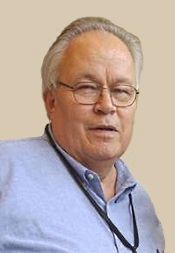 Mr. Thomas currently hosts two shows on one of the nation's premiere classical music radio stations, KDFC. Through world-wide streaming audio, he brings his experience and love for Baroque and choral music to a global audience. "The Beethoven Journey" with Piano Concerto No. 5 and Choral Fantasy: For the third spring in a row, the MCO joins its Artistic Partner Leif Ove Andsnes for performances in Reggio Emilia, Turin, Lugano, Prague and Bergen. This time, Beethoven's Piano Concerto No. 5 and the rarely heard Choral Fantasy are the focus of the programme. Both works are being recorded by Sony Classical at the Prague Spring Festival and together complete a three-part CD cycle. The orchestra opens the concerts with Igor Stravinsky's Concerto in E-flat "Dumbarton Oaks". The MCO's education project series for hearing-impaired children "Feel the Music" accompanies every tour of the "Beethoven Journey". This May, the project takes place in Norway for the first time, in Leif Ove Andsnes' home city of Bergen. Together with the orchestra, hearing-impaired children aged 8-13 years old explore how music can be experienced with all of the senses. On 9th June at Dresden's Frauenkirche, the MCO performs a memorial concert for its late founding mentor Claudio Abbado, who passed away in January. The concert, featuring works by Richard Wagner, Gustav Mahler and Robert Schumann, will be conducted by Daniele Gatti, with Waltraud Meier and René Pape as soloists. As part of its education programme MCO Landings, nine musicians from the MCO worked with the Filarmónica Joven de Colombia in April, coaching rehearsal sessions, leading sectionals and teaching chamber music to the 16-24 year old musicians. In his tour diary, MCO violinist Christian Heubes reports on his experiences with the young people during his week there, which included salsa, table tennis and the unique countryside of Colombia, in addition to the musical work. Distinguished Concerts International New York (DCINY) brings the stirring sounds of bluegrass and Americana back to Carnegie Hall with an encore performance of Carol Barnett's "The World Beloved: A Bluegrass Mass" featuring superstar duo Dailey & Vincent, and the New York premiere of John Purifoy's "The Chronicles of Blue & Gray," a work which weaves American folk songs, spirituals and battle cries with tunes and lyrics from the post-Civil War era. Excellent choruses from six states form the Distinguished Concerts Singers International for the thrilling afternoon concert on Sunday, June 8 at 2:00pm at Carnegie Hall's Stern Auditorium/Perelman Stage, New York City. While bluegrass music and a church mass might seem like an unlikely pairing, it was the country music infused with a church flavor that inspired composer Carol Barnett to write "The World Beloved": "My highest hope," says Barnett, "is that listeners coming from one tradition—classical or bluegrass—and perhaps dubious about the other might discover something new and wonderful in the combination." Award-winning composer Barnett teamed with poet, playwright and novelist Marisha Chamberlain for the work which blends modern choral sophistication, poetry and traditional bluegrass instrumentation into an exhilarating musical experience. DCINY Debut Conductor Jefferson Johnson leads the Distinguished Concerts Singers International and special guests, bluegrass superstars Dailey & Vincent. Dubbed the "rock stars of bluegrass" by CMT, the group is a perennial favorite on the touring and festival circuit, playing over 115 shows each year. Their many honors include two Grammy nominations and three consecutive International Bluegrass Music Association Awards for Entertainer of the Year. Dailey & Vincent will also perform a set of their own material from across their vast repertoire. A perfect pairing for this concert on the Americana theme is the New York premiere of Chronicles of Blue & Gray by John Purifoy, Composer-in-Residence. Purifoy gathered a variety of material representing struggles and triumphs from the century and a half that has passed since the American Civil War, including texts from Lincoln's two Inaugurals, the Gettysburg Address, and the Emancipation Proclamation. New York judge and poet, Francis Miles Finch, who, two years after the war, penned the healing words, "The Blue and the Gray." 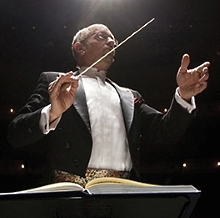 Acclaimed conductor, composer, writer and educator Michael Adelson, formerly on the conducting staff of the New York Philharmonic, conducts the Distinguished Concerts Orchestra and Singers International. DCINY Artistic Director & Principal Conductor Jonathan Griffith serves as Chorus Master. Since 2002, Composers & the Voice has been the crucible for many of AOP's recent shows as well as numerous opera premieres around the country. Today and Monday you can hear into the future of contemporary opera. A concert of world premiere songs by Guy Barash, Avner Finberg, Jeremy Gill, Andreia Pinto-Correia, Gity Razaz, Joseph Rubinstein and librettist Jason Kim. Hosted by Daron Hagen (5/18) and Conrad Cummings (5/19). Performances by Deborah Lifton, Kristin Sampson, Rachel Calloway, Dominic Armstrong, Jorell Williams, and Matthew Burns. Music Directors: Mila Henry, Kelly Horsted and Charity Wicks. Georg Solti, London Symphony Orchestra. HDTT HDCD346. 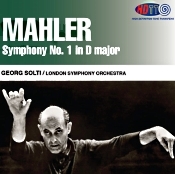 For years now I've been undecided about which of Maestro Georg Solti's recordings of Mahler's First Symphony I liked best, the earlier, analogue one with the London Symphony Orchestra presented here or the later digital release with the Chicago Symphony. I had always preferred the earlier performance but liked the later rendition's sound. Now, thanks to HDTT's remastering of the LSO account I can have my cake and eat it, too. Their refurbishing of the older recording sends it to the top of the list of available Mahler Firsts. Anyway, you probably know that Austrian composer and conductor Gustav Mahler (1860-1911) wrote his Symphony No. 1 in D major in 1888 and premiered it in 1889, calling it at first a symphonic poem rather than a symphony and temporarily, at least, giving it the nickname "Titan." It wasn't long, however, before he revised it to the four-movement piece we know today and dropped the "Titan" designation. The work's popularity soared in the late Fifties, the beginning of the stereo age, possibly because the composer scored the First for a very large orchestra, and with its soaring melodies, enormous impact, and dramatic contrasts it makes a spectacular listening experience and an ideal way to show off one's stereo system. Plus, the First is one of Mahler's briefest symphonies, making it an ideal length for folks like me with short attention spans. In the Symphony No. 1 Mahler said he was trying to describe a protagonist facing life, with a progression beginning with the lighter moments of youth and proceeding to the darker years of maturity. In the first movement, "Spring without End," we see Mahler's youthful hero in the symbolic stirring of Nature before a long spring. In the second-movement Scherzo, "With Full Sail," we find Mahler in one of his early mock-sentimental moods, displaying an exuberance that he may have meant as ironic. In the third movement we get an intentionally awkward funeral march depicting a hunter's fairy-tale burial, which comes off as a typical Mahler parody. It may represent the hero's first glimpse of death or maybe Mahler's own recollection of a youthful encounter with the death of a loved one. The movement has long been one of the Mahler's most controversial, with audiences still debating just what the composer was up to. Then, in the finale, Mahler conveys the panic "of a deeply wounded heart," as his central figure faces the suffering of life and fate. Still, Mahler was a spiritual optimist and wanted Man to triumph in the end. In the final twenty minutes or so, Mahler pulls out all the stops and puts the orchestra into full swing. Not only does this earlier of Solti's Mahler First recordings sound more lively and energetic than his later digital effort, it really is quicker. Solti takes all four movements at a brisker, more enlivened pace than he did twenty years later. It shows in every note we hear, the electric vitality and spirit. Yet the conductor never overdoes anything, either. This may be a high-powered performance, but it is not an exaggerated one. Solti's way with the opening lines, the awakening of spring, is really quite enchanting, probably the most impressionistic, atmospheric reading of this sequence on disc. Then he builds to some very exciting crescendoes and climaxes, with ravishing playing from the LSO. When the conductor does slow down, it's with warmth and grace, often sweet and moving. Yet it's probably the big moments one remembers most, like the closing of the first movement and the opening of the finale. Here, you'll find Solti in full swing, aiming for the center-field seats, while still maintaining the shape and structure of the music, never distorting it for sensational effect. HDTT remastered the present disc from a London 4-track tape originally recorded in February 1964 at Kingsway Hall, London, by Decca producer John Culshaw and engineer James Lock. Compared to the old Decca disc, the new HDTT remastering is quieter, cleaner, more transparent, and more dynamic. Not only is the definition crisper and more solid, there is a greater sense of orchestral air and depth than I've heard from the recording before. Additionally, there's a greater smoothness involved, a more natural sound than ever. And if that weren't enough, it even sounds better to me now than Solti's 1984 digital account: more open and more realistically distanced, with clearer highs (if very occasionally a little aggressive), stronger impact, quicker transient response, and more detail. As I say, it goes to the top of my list of favorite Mahler First recordings, sonically and musically. Also, Piano Trio, Op. 11. The Eroica Trio; Prague Chamber Orchestra. EMI 7243-5-62655-2. How do you make beautiful music even more beautiful? You could start by having three exceptionally beautiful and talented people play it. But beyond the obvious physical appeal of the Eroica Trio's membership--pianist Erika Nickrenz, violinist Adela Pena, and cellist Sara Sant'Ambrogio--there is playing of care, fluidity, and sophistication. Performing together since they were children and formalizing their group well over a decade ago, these three artists have perfected their style in a graceful give-and-take of musicianship. Their work on the Triple Concerto is a delight. The first thing one notices about this performance of Beethoven's Concerto for Violin, Cello, and Piano in C major, Op. 56, however, is not necessarily the easygoing refinement of the Eroica Trio's presentation, but the fact that the Prague Chamber Orchestra accompanies them. This means a lighter, airier interpretation than one normally hears from a full orchestra. Indeed, because listening to more grandiose productions like that of the Berlin Philharmonic under Herbert Karajan with stars David Oistrackh, Mstislav Rostropovich, and Sviatoslav Richter (EMI or Hi-Q) have spoiled me, it took a few minutes for my mind and ears to adjust to the smaller proportions of the Eroica Trio's presentation. But adjust I did, in time to appreciate the quiet elegance these ladies exude throughout their reading. And since the Triple Concerto provides for a supple interplay of soloists and orchestra, as well as sporadically highlighting each solo instrument individually, the piece allows the Eroica Trio to display all their liveliness and charm together as well as separately. While, admittedly, they can't match the all-star Karajan team, they bring an affectionate warmth of their own to the piece. I wish the Prague Chamber Orchestra had shown as much enthusiasm for the work as the principal players did, though. Accompanying the big Triple Concerto on the disc we find Beethoven's smaller, earlier, and more playful Piano Trio, Op.11, which is also a captivating little work of surprisingly complementary design. The three Eroica Trio musicians play it tastefully, gracefully, and with at least a modest élan. EMI's sound in this 2003 release (now Warner Classics' sound, I suppose) tends to emphasize the three soloists quite a lot more than it does the orchestra, but no doubt that's as it should be, so it's not a big complaint. The sonics are delicate and smooth, perhaps lacking that final degree of transparency, air, dynamics, and dimensionality that might put the recording in the audiophile class, but compensating for it by the affability of its performances. The disc makes a good companion to, but surely not a replacement for, the classic EMI Karajan all-star recording I mentioned above. 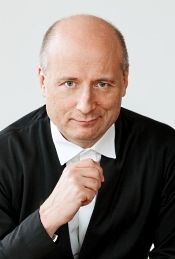 Nicholas Angelich, piano; Paavo Jarvi, Frankfurt Radio Symphony Orchestra. Erato 0825646322954 (2-disc set). When Erato first released the two Brahms Piano Concertos with pianist Nicholas Angelich, Maestro Paavo Jarvi, and the Frankfurt Radio Symphony Orchestra separately a few years ago, they escaped my attention. They did not, however, escape the attention of a lot of listeners who apparently loved them. Now that Erato has repackaged them together in a two-disc set, and I've had a chance to hear them, I can understand the public's approval. While Angelich doesn't quite displace my favorite sets from Kovacevich (Philips) and Giles (DG), this newer contender seems reasonably well recorded and comes at an agreeable price. It's a set to consider. German composer Johannes Brahms (1833-1897) wrote his Piano Concerto No. 1 in 1858 while he was still a young man in his twenties. I've always seen the work as all craggy and monumental in scope, full of the boundless energy of youth. After a long and imposing orchestral introduction from Jarvi and the Franfurt RSO that does the concerto justice, Angelich enters relatively gently but enthusiastically. Here, we find in Angelich's playing a tempered combination of melancholy, drama, and Romantic lyricism. 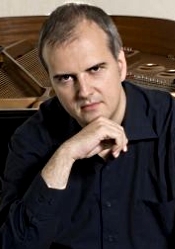 To his credit, the pianist seems more concerned with communicating the music's sweetness and light than its sometimes melodramatic passions. Then Angelich tackles the Adagio, an elegiac tribute to Brahms's late mentor, Robert Schumann, with a touch less sentimentally than some other artists. He rightly emphasizes its spiritual qualities but without quite the gush we occasionally get. It's a straightforward, unadorned reading, all the more effective for it. The finale comes as almost a surprise, a kind of rustic peasant dance that swirls and whirls its way through a series of variations. Angelich handles with it with commendable vitality, the orchestra always providing a sympathetically lively accompaniment. The Brahms Second Piano Concerto (1881) appeals to me more than the First Concerto, maybe because it seems more mature, more lyrical, and more tuneful, and maybe because I'm just a sentimental Romanticist and find the Second Concerto more heartfelt. In any case, Brahms wrote it many years after the First Concerto, and it's unusual in its four-movement structure. Apparently, Brahms included an extra movement, a scherzo, because he thought the opening movement sounded too plain and simple. In the Second Concerto Angelich seems more inclined to a full-throated voice than he did in No. 1, yet he maintains much poetry in the process. It's a delicate but successful balance of expression, the emotions rising and falling in smooth succession. Moreover, the dialogue between piano and orchestra seems even better integrated, with Angelich and Jarvi in complete harmony. Angelich and company go on to communicate a buoyant, rhythmic, delicately powerful thrust in the scherzo. Then the piano takes an appropriately secondary role in the sweetly tuneful Andante (where the cello practically steals the show). Finally, Angelich ends the work with a quietly prancing, lightly dancing demeanor that is every bit as charming as the music demands. If there is any minor drawback to the set, it's that the folks at Erato chose to offer nothing but the two concertos on the two discs, omitting the other stuff that filled out the previous single-disc editions. Still, the price is affordable (with some on-line sites selling it absurdly low), so one shouldn't complain. Producers Udo Wurstendorfer and Etienne Collard and engineer Thomas Eschler made the recordings in 2007 (Concerto No. 1) and 2009 (Concerto No. 2) at Sendesaal, Hessischer Rundfunk, Frankfurt, Germany. As we might expect from recordings made in the same location, the different producers and two years separation notwithstanding, the sound is pretty much alike in both concertos with perhaps a very small advantage in clarity going to the second outing. In any case, the sound in both concertos is complementary to the performances. This is not to say it's entirely transparent, however; it's simply big and voluminous, the louder passages hampered very slightly by hall resonance. Nevertheless, the sound is natural enough and undoubtedly faithful to the recording environment. Most of the time, the hall acoustics provide a flattering ambient bloom, and, as I say, only in the more-emphatic sections do the sonics lose a little definition. Otherwise, the recording sounds warm, spacious, wide ranging, if a tad soft. Suites for Two Pianos; Symphonic Dances. Natalia Lavrova and Vassily Primakov Piano Duo. LP Classics 1019. Natalia Lavrova and Vassily Primakov are award-winning, Juilliard-trained concert pianists who formed a partnership in 2010 as the Lavrova Primakov Piano Duo. Moreover, their friendship and musical collaboration also led them to create their own record company, LP Classics, of which the present Rachmaninov recording is, I believe, their third release. As the duo explain it, LP Classics "is committed to unearthing lost historical gems, presenting never-before released recordings, and enriching the discographies of emerging stars of the new generation." I assumed when I heard their previous album that the "LP" stood for Lavrova-Primakov and not simply as in the old days "long-playing." 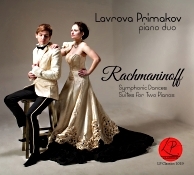 Maybe, I surmised, we could also think of "LP" as "lovely performances," and certainly such a description continues to fit their new Rachmaninov release. When I reviewed the duo's last album, among the things I praised about them was the thoughtful perception and insightful response that made their interaction so good; their pianistic skills and imposing display of musical gymnastics; their impeccable showmanship; and their total accord with one another's playing. The same applies here to these three selections from Russian composer and pianist Sergei Rachmaninov (1873-1943), the duo sounding quite spectacular at times. The first item on the program is the Suite No. 1 (Fantasie-Tableaux for Two Pianos), Op. 5, a composition for two pianos that Rachmaninov wrote in 1893 while still a young man. To my knowledge, he never arranged it for orchestra, and it gets only occasional recordings. In the best Romantic tradition of his day, the composer based each of the four movements on parts of poems: the Barcarolle: Allegretto in G minor on a work by Mikhail Lermontov; La nuit... L'amour: Adagio sostenuto in D major ("The night...the love") on a poem by Lord Byron; Les Larmes: Largo di molto, in G minor ("The Tears") on a poem by Fyodor Tyutchev; and Pâques: Allegro maestoso in G minor ("Easter") on a poem by Aleksey Khomyakov. Starting with the Barcarolle, or "boatman's song," Lavrova and Primakov demonstrate their sensitivity, the notes flowing in smooth, luxuriant harmony. You can almost hear the ripple of the water beneath the gondolier's oar. The duo's treatment of the second-movement love poem is warm, lyrical, and lovely, pure Rachmaninov. The Largo is as delicate as one can imagine, light as a feather on the breeze. Then the duo go out with a finale of imposing proportions, the great bells of the church tower peeling grandly. Next, we find the Suite No. 2 for two pianos, Op. 17, which Rachmaninov wrote in 1901, just after he recovered from the shock and disappointment of the initial performance of his First Symphony. In the Second Suite he did not try to illustrate poems but wrote it in a customary four-movement arrangement: Introduction: Alla marcia in C major; Valse: Presto in G major; Romance: Andantino in A flat major; and Tarantelle: Presto in C minor. In the Second Suite we get a more-mature, more adventurous work from the composer, and Lavrova and Primakov explore it with an appropriate impetuosity. The results are quite lively in the opening two movements, equally charming and graceful in the third segment, and most exciting in the concluding Tarantelle. The last item and for me the highlight of the album is Rachmaninov's Symphonic Dances, Op. 45, which he wrote for two pianos in 1940, at the same time arranging it in its more-popular orchestral version. In this regard, it may remind one of Stravinsky's Rite of Spring, also written for piano but more famous in its orchestral arrangement. 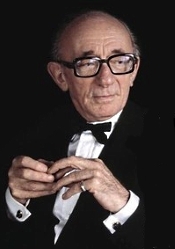 The composer premiered the piano rendition at a Hollywood party in which Vladimir Horowitz and he played it together. Don't you wish you were at that party? Anyway, maybe because I'm so familiar with the orchestral arrangement, I wasn't sure what to expect from this first-time listening to the two-piano version. But Lavrova and Primakov bring to it such a lusty zeal, it's hard to resist. No, two pianos don't have the sheer power of a full symphony orchestra, yet as the piece goes on the duo manage to make one almost forget that there even is an orchestral version. Whether it's a quiet, lingering passage or a full-throated attack, Lavrova and Primakov handle it with the utmost refinement, respect, enthusiasm, virtuosity, and bravura. I found it thoroughly delightful and engrossing and couldn't help thinking as I listened that Rachmaninov and Horowitz would find it likewise. If I have any criticism of the product at all, it isn't about the music or the performances. Instead, it's about the omission of an accompanying booklet of notes. OK, it's probably a cost-saving measure, I understand. Nevertheless, if that's the case, how to explain the three-paneled, glossy laminated, Digipak-type container the disc comes in? While the packaging certainly looks handsome, it's surely not cheap. Ah, well, I quibble. Producer and engineer Alexey Gorokholinsky recorded the album in Stratton, Vermont, October 2013. The sound has a sweet, airy quality about it, clear but mildly resonant, too, providing a complementary sonic experience. Given that there are two pianos involved, you'd expect to worry about an exaggerated stage width, but not so. The two pianos appear at a moderate distance, centered between the speakers quite realistically. Transient response, dynamics, frequency range, and, as I say, acoustic ambience are exemplary, the sound never bright or forward or veiled but just right for easy, natural listening. Philharmonia Baroque Orchestra has received a $1 million gift from The Waverley Fund to name its Conductor's Podium. The gift is timely as the organization also announced the beginning of the public phase of its Campaign for the 21st Century, an $8 million comprehensive fundraising effort and the largest effort in the organization's history to develop vital artistic projects and strengthen organizational capacity. This extraordinary milestone gift is the largest in the Orchestra's 33-year history, and will support recordings, video, alternative concert formats, touring, and the organization's signature Bay Area concert series. This visionary gift by The Waverley Fund reflects a deep commitment to the Orchestra's continued artistic excellence and honors the tremendous contributions of Nicholas McGegan, the Orchestra's Music Director of 29 years. "It is an honor to serve as Philiharmonia's Music Director for the past 29 years," said Nicholas McGegan. "I greatly value The Waverley Fund's devotion to the Orchestra and Chorale. Their belief that Philharmonia's music should be shared far and wide is at the heart of their gift, and I'm deeply gratified by their generosity." Ross Armstrong, President of the Board of Directors, remarked, "The Waverley Fund has always valued the uncompromising artistic integrity of the Orchestra and Chorale. This visionary gift is intended to deepen artistic innovation and preservation at this important time in the Orchestra's history. Their passionate commitment to period-instrument performance is an inspiration and a testament to their commitment to Philharmonia's continued excellence here in the Bay Area, as well as nationally and internationally. One of the finest conductors in the world, Nicholas McGegan has put a spotlight on Philharmonia. By naming the Conductor's Podium, The Waverley Fund has recognized the impact of Philharmonia Baroque Orchestra and its artistic director." In 2010, Philharmonia's Board of Directors launched the Campaign for the 21st Century to help ensure the Orchestra's ability to pursue important artistic projects, maintain its superior artistry, and build organizational capacity in a changing cultural landscape. During this time, the Campaign for the 21st Century has secured just over $6.5 million in gifts and pledges. Wednesday, May 21, 12:15–1 p.m.
For the May program, "The Great Chicago Boogie Woogie Pianists," Music Institute faculty member Eric Sutz talks bout the history and performs in the different styles of artists Jimmy Yancy, Pinetop Smith, Albert Ammons, Meade Lux Lewis, and a number of others. Sutz also performs several pieces of more contemporary boogie pianists, such as Dr. John and Allen Toussaint. Contact! at the Biennial, at SubCulture: "An Evening of Young American Composers"
A co-presentation with the New York Philharmonic and 92nd Street Y. This season's collaboration between 92nd Street Y and the New York Philharmonic in CONTACT!, the Philharmonic's new-music series, is one of the highlights of the inaugural NY PHIL BIENNIAL, a kaleidoscopic exploration of today's music, May 28–June 7. The series returns to the vibrant new underground performing arts space SubCulture on Bleecker Street for a program that is "made in the USA"— works for solo instruments by six emerging American composers, including five World Premiere–New York Philharmonic Commissions and a New York Premiere, performed by New York Philharmonic musicians. Marc Kaplan, co-founder/director of SubCulture, will host the concert, briefly interviewing each composer and soloist duo before their work is performed. All audience members attending this concert are invited to meet composers and performers at the bar in SubCulture as part of the post-concert NY PHIL BIENNIAL Play Date, one of several meet-ups taking place during the biennial. Biennial Pass holders will receive a total of two free drink vouchers redeemable at Play Dates. Paola Prestini: Eight Takes (for solo cello), with Sumire Kudo, cello. Eric Nathan: As Above, So Below (for solo trombone), with Joseph Alessi, trombone. Oscar Bettison: Threaded Madrigals (for solo viola), with Rebecca Young, viola. Ryan Brown: Four Pieces for Solo Piano, with Eric Huebner, piano. Michael Hersch: Of Sorrow Born: Seven Elegies (for solo violin), with Yulia Ziskel, violin. Chris Kapica: Fandanglish (for solo clarinet), with Pascual Martínez Forteza, clarinet. Thursday, May 15 at 11 a.m. - 92nd Street Y, New York City. Every one of YPC's 12 Satellite Schools is excitedly preparing to sing with and for each other in a free concert presented by the Young People's Chorus of New York City at the 92nd Street Y. Under Satellite Schools Director Elizabeth Núñez and YPC conductors Emma Brondolo, Cara Bernard, Maria Pena, Nathan Reiff, and Sheldon Ogbourne, the children-900 strong-will sing a program of music ranging from classical and jazz to folk and pop. The children are eagerly looking forward to singing on a professional stage on this joyous occasion. Please come. The concert for all ages is free and open to the public. Saturday, May 17 at 7 p.m. - Church of the Holy Trinity (316 East 88th Street), New York City. You won't want to miss the next concert in YPC's Transmusica series, designed to build bridges to other world cultures, when YPC and Artistic Director/Founder Francisco J. Núñez welcome three award-winning choruses from the Kingswood Oxford School in West Hartford, Connecticut. They will take the audience on a musical journey that circles the globe from Russia and the Torres Strait Islands, across the Pacific through the U.S. and onto Greece, Israel, and Serbia, with stops in between for two world premieres: Quatro Colores by Jim Papoulis in Spanish, English, and Yiddish and Bobobo by Douglas J. Cuomo, based on a traditional folk song from Ghana. The concert is free and open to the public with a suggested donation of $10 at the door. Eminent English choirmaster and composer Philip Moore will make his Chicago-area conducting debut when he leads the St. Charles Singers in an all-British season-finale program at 7:30 p.m. on Saturday, May 17, 2014, at Grace Lutheran Church, 7300 Division St., River Forest, Il, and at 4 p.m. on Sunday, May 18, at Baker Memorial United Methodist Church, 307 Cedar Ave., St. Charles, Il. Judgment Day meditation. Brass will include four trumpets, French horn, three trombones, and tuba. The percussion section will comprise timpani, snare and bass drums, cymbals, glockenspiel, and xylophone. Spanning from the English Renaissance to the present day, the program of sacred and secular music, including arrangements of British folk songs, will offer works about peace, with Memorial Day in mind, and works celebrating the joys of spring. In addition to guest conductor Moore's own composition, the program will include Edward Bairstow's "Let All Mortal Flesh Keep Silent," Benjamin Britten's "The Evening Primrose," William Byrd's "Solve, iubente Deo," John Clements's "Flower of Beauty," Herbert Howells's "Magnificat," Gustav Holst's "I Love My Love," Peter Knight's arrangement of John David's "You Are the New Day," and Felix Mendelssohn's "Verleigh uns Freiden." (Although German-born, Mendelssohn spent a total of about 20 months in Britain, where his popularity and influence were considerable.) Also: Robert Pearsall's "Lay a Garland," John Rutter's "Dashing Away with the Smoothing Iron," Charles Stanford's "Beati Quorum Via," Thomas Tallis's "Miserere Nostri," and Ralph Vaughan Williams's "Lord, Thou Hast Been Our Refuge," "The Dark Eyed Sailor," and "The Turtle Dove." Single tickets for the May "Bouquet of Voices" concerts are $40 general adult admission, $30 for seniors 65 and older, and $10 for students. Tickets and general information about the St. Charles Singers are available at www.stcharlessingers.com or by calling (630) 513-5272. Tickets are also available at Townhouse Books, 105 N. Second Ave., St. Charles, Il (checks or cash only at this ticket venue). Tickets may also be purchased at the door on the day of the concert, depending on availability. Group discounts are available. Christopher Bono describes Unity and The Unexcelled Mantra as contemplating the search for a modern form of spirituality. He says, "Both works explore a path to transcendence or 'true being' through union with the cosmos – The Unexcelled Mantra from a Mahayana Buddhist point of view and Unity from the Western philosophical tradition of Plato." Unity is based on some of the musical and philosophical concepts of Plato's Republic. The chosen text was taken from a section of the Republic in which Plato discusses the power of mathematics, but Bono immediately saw it could also be viewed as a metaphor for the phenomenon of meditation: "What is absolute unity? / This is the way, / In which the study of One / has the power / of drawing and converting the Mind / to the contemplation / of True Being." Bono says, "This multi-dimensional observation was a key inspiration for me when writing the work, both considering the mathematical qualities of music and the esoteric concepts of achieving union with the All." In addition, Bono experimented with the power Plato claimed existed in the Dorian and Phrygian modes. According to Plato, the Dorian would "fittingly imitate the utterances and accents of a brave man who is engaged in warfare," while the Phrygian was suitable "for a man engaged in works of peace." Of his video for Unity, Tobias Stretch says, "Unity is about the pursuit of oneness and absolute being. The biggest challenge was how to illustrate those intense abstract ideas through animation. A dream-like world unfolds where surreal beings drift towards a point of convergence, a street character is aided by otherworldly characters (perhaps real or not) towards a point of absolute oneness. Unity is about the transcendence of being to another level." Visual artist DZO Olivier created the original illustrations for the cover art for Unity and The Unexcelled Mantra audio recordings, intimately influenced by Bono's music and the concepts it explores. The Bang on a Can All-Stars are special guests on PBS KIDS's popular cartoon featuring everyone's favorite aardvark, Arthur, in an episode called "Binky's Music Madness" airing nationwide on May 14, 2014 as part of Arthur Arts Week, which celebrates the arts with three all-new episodes beginning on May 12. For the occasion, Bang on a Can is offering Arthur fans (and the public in general) a free download of the music featured on the episode, from the All-Stars 2012 album "Big Beautiful Dark and Scary" (http://bit.ly/BOACDownload). Two years in the making, the animated All-Stars lineup includes founding Bang on a Can All-Star clarinetist Evan Ziporyn, percussionist David Cossin, guitarist Mark Stewart, bassist Robert Black, cellist Ashley Bathgate, and pianist Vicky Chow. Bang on a Can co-founder composer Julia Wolfe is also portrayed and recorded her own speaking role for the episode. In "Binky's Music Madness," the Bang on a Can All-Stars take Elwood City by storm. Everyone is intrigued by their funky brand of experimental music. It sounds like nothing they have ever heard before! Binky is skeptical though. A musical purist, he sets out to prove that their musical compositions are more noise than music. Recording everything from dogs barking to tummy gurgles, Binky composes his very own soundscape and attempts to pass it off as the work of a hot new musical group. But the joke's on him when all the kids – and even Binky – realize it's not only music, it's pretty good! Also, John Adams: Violin Concerto. Chad Hoopes, violin; Kristjan Jarvi, MDR Leipzig Radio Symphony Orchestra. Naive V5368. Quick: What do nineteenth-century German Romantic composer Felix Mendelssohn (1809-1847) and contemporary American minimalist composer John Adams (b. 1947) have in common? Correct: They both write music. 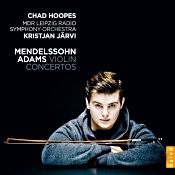 Naturally, the booklet notes try to explain why young American violinist Chad Hoopes chose to pair two disparate violin concertos by these two dissimilar composers in his debut album. I didn't find the arguments very convincing, however, the most persuasive one being that the two concertos are among the performer's favorites. Now, that's fair enough. Mr. Hoopes bears a slight if superficial resemblance to Justin Bieber, which can't hurt album sales. Moreover, from what I hear on this disc, he has about an 800:1 talent-ratio advantage over Mr. Bieber, which definitely can't hurt album sales. 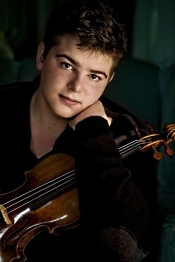 Mr. Hoopes won first prize in the Young Artists Division of the 2008 Yehudi Menuhin International Violin Competition and has since appeared with a number of ensembles throughout the world. The present album is, as I say, his first foray into the recording field. Anyhow, the program begins with Mendelssohn's Violin Concerto No. 2 in E minor, Op. 64 (more commonly known simply as the Mendelssohn Violin Concerto). The composer premiered it in 1845, and it would be his last big orchestral work. Fortunately, he went out in style, the concerto being among the most popular in the violin repertoire. Donald Rosenberg in an accompanying essay notes the Mendelssohn concerto's "impetuous phrases with which the violin opens." It's probably this quality of impetuosity that best describes Hoopes's playing; while other violinists have probably provided more emotion, more sympathy, more sentimentality, more overt Romanticism in the concerto, Hoopes brings an appealing tone of controlled youthful enthusiasm to it. Not that the tempos are overly brisk; Hoopes just moves them forward with a good, strong thrust, bringing out more of the work's rhythmic characteristics than some other violinists do. Hoopes takes the lovely melodies of Mendelssohn's second-movement Andante more quickly than usual, yet he does them little or no harm, again emphasizing the movement's dramatic momentum over its more-delicate lyric phrasing. And, again, this is not a bad approach, just a different one. The movement still retains much of its beauty and grace. John Adams premiered his Violin Concerto in 1994, and while it doesn't approach anything like the popularity of the Mendelssohn (because, as you know, for most modern composers tunefulness appears forbidden), the music is, nevertheless, innovative and fun in its own way. The Adams concerto is definitely a modern piece, and one has to accept that fact at the outset. Even the movement notations are unique: , Chaconne: 'Body Through Which the Dream Flows,' and Toccare (Italian, "to touch"). Well, right there you know you're in for something out of the ordinary. The violin enters almost immediately, and from that point Hoopes continues an upward spiral of continuous notes. The music becomes more insistent as it carries on in an ever-forward circular pattern of rhythms, Hoopes making the most of its sometimes eerie transformations. Even though you won't find the melodic lines of a Mendelssohn here, you'll find Hoopes is able to keep your attention with his well-animated playing. As with the Mendelssohn, the first movement of the Adams piece glides readily into the second, darker, evocative slow movement, and Hoopes negotiates the transition effortlessly, supported by excellent, well-modulated accompaniment from Maestro Kristjan Jarvi and the MDR Leipzig RSO. Then, in the finale, we get a vigorous, quick-paced dance, with hints of Adams's Shaker Loops throughout. OK, so maybe there are more similarities between the Adams and Mendelssohn pieces than at first meet the eye (or ear), at least structurally. Hoopes ends the Adams work with another of his bursts of impetuous energy, making in all an enjoyable ride. Naive recording producer Alfredo Lasheras Hakobian and balance engineer Evelyn Ruhlemann recorded the album at the MDR-Studio Leipzig in November 2013. With the soloist front and center (but not too much so), the sound is fairly natural, with a decent dynamic range, good frequency extensions in treble and bass, and a modest midrange transparency. It's pretty much all most listeners could ask for in this music, including a moderate depth to the supporting ensemble, a mild resonance, a sweet warmth, and a realistically nuanced violin tone.